This breakfast casserole was awesome. 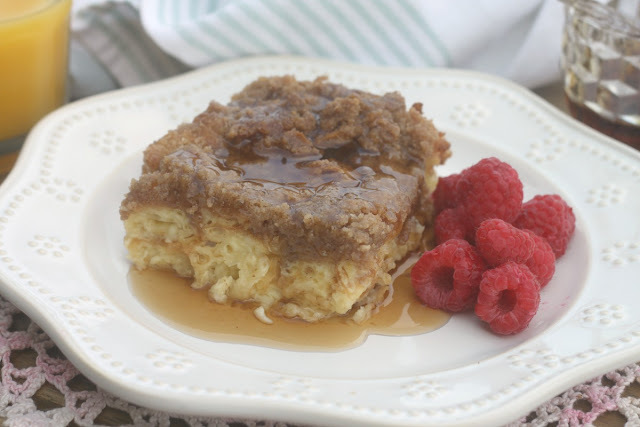 There are 2 things I really like about this casserole, 1 it was an overnight casserole and 2 the heavenly crunchy cinnamon topping! 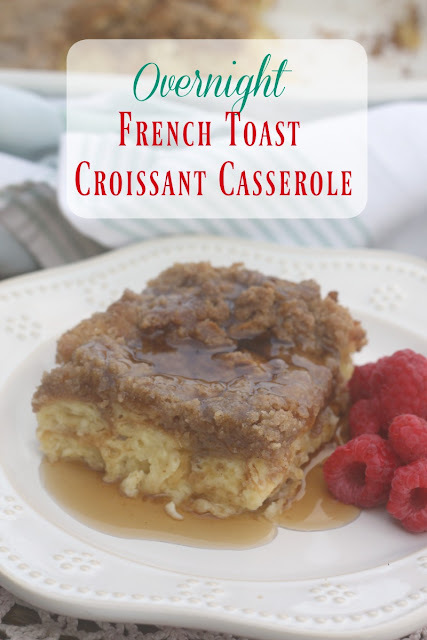 It saves so much time having a breakfast casserole that is mixed together the night before and then baked in the morning and this casserole did not disappoint! 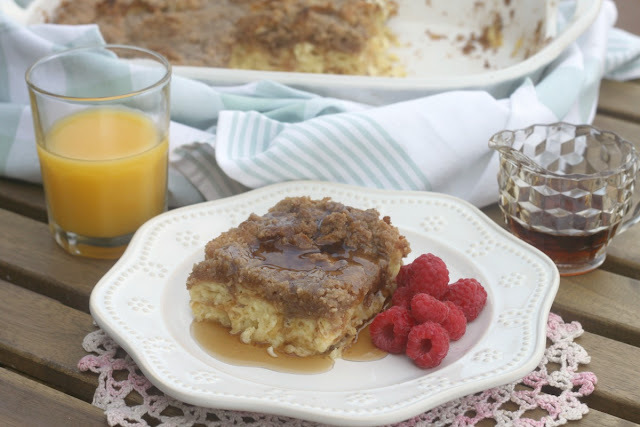 The crunchy cinnamon topping reminded me of a coffee cake and the egg custard croissant base reminded me of a favorite dessert of mine.... bread pudding. I love anything baked in an egg custard! The casserole was a recipe that I adapted from Pioneer Woman. In her casserole she uses french bread. I had left over croissants from lunch this week but feel free to use any left over bread you may have on hand. 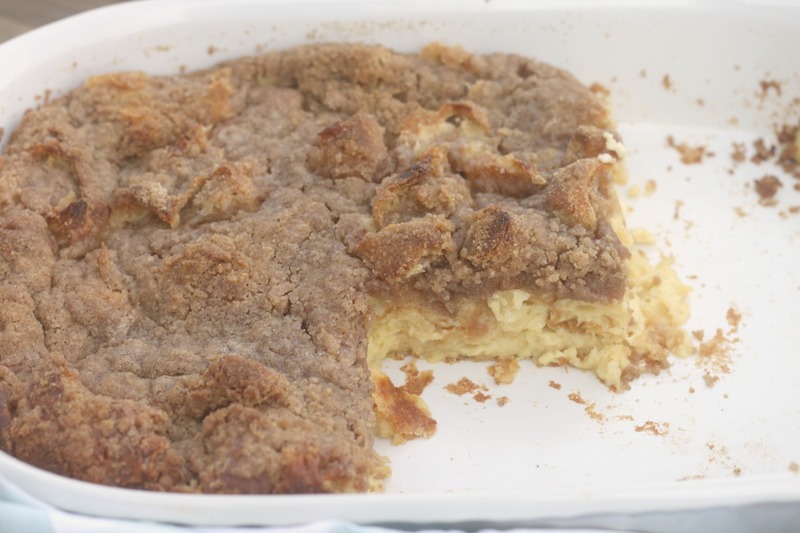 In the picture above you can see the cinnamon topping I put over the casserole and it was the same topping you would put on top of coffee cake. Grease a 9 x 13-inch baking pan. Tear croissants into chunks and evenly distribute in the pan. In a medium sized bowl mix together eggs, milk, cream, sugar, and vanilla. Pour evenly over the croissants. Cover tightly and store in the fridge for several hours or overnight. In a separate bowl, mix flour, brown sugar, cinnamon, nutmeg and salt. Add butter pieces and cut them into the dry mixture until mixture resembles fine pebbles. Store in a Ziploc in the fridge. 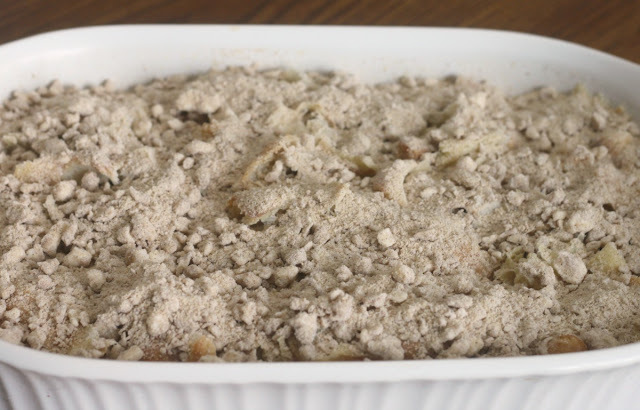 When you're ready to bake the casserole, preheat oven to 350 F. Remove casserole from the fridge and sprinkle crumb mixture over the top. Bake for 45 minutes for a softer, more bread pudding texture. Bake 1 hour or more for a firmer, less liquid texture. I baked mine for 50 minutes but next time I am going to bake for 1 hour for a more crispy casserole. Looks delicious! I'm going to put this on my things to make during the holiday season... yum! I will take a piece with a cup of coffee please! Love the croissants in there. Yummy!